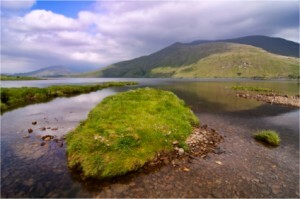 Irish mountains can be challenging. You should take the following precautions in order to maximize enjoyment and enhance your chances of a safe return. Consider the equipment, experience, capabilities and enthusiasm of the party members. Check the weather forecast before you set out and be prepared to change or abandon plans if the weather is unsuitable. Learn basic first aid and bring a first aid kit. Many accidents occur towards the latter part of the day when your energy levels are down and your phone battery life is low. Did you remember to charge your battery before setting out? 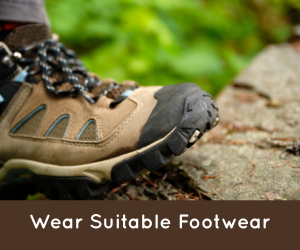 Wear suitable boots with a treaded sole, which provide good support for ankles. It is advised that clothing should be colourful, warm, windproof and waterproof. Take spare warm clothing, a hat and gloves; it is generally colder the higher you go. Food – In addition to your usual food intake, take chocolate, dates, or similar sweet things, which restore energy quickly. You may not need them yourself, but someone else may. Drink – In warm conditions dehydration can be a real problem, your body uses more water climbing than walking on level ground. Take plenty to drink, as you become more experienced you will become better able to judge the amount of fluid your body requires under different conditions. A map, compass (and the ability to use them), and at least one reliable watch in the party should always be carried. In all conditions, you should carry a whistle, torch, spare batteries, bulbs and a survival bag. If in groups, make sure party leaders are experienced; do not let the party become separated. Take special care of the youngest and weakest in dangerous places. If you prefer to go alone, be aware of the additional risk. Be prepared to turn back if conditions are against you; the Mountains will still be there tomorrow. If you have a serious problem, get a message to Mountain Rescue (via the Gardai 999) for help as soon as possible and keep injured/exhausted people safe and warm until help reaches you. If you cannot contact anyone, use six whistle blasts or torch flashes, repeated at minute intervals, to signal an emergency. Report changes of route or timetable to someone who is expecting you. advised of best practice when contacted. If you are able to summon help using your mobile phone KEEP IT SWITCHED ON SO YOU CAN BE RE-CONTACTED. It is no disgrace to turn back if not certain. 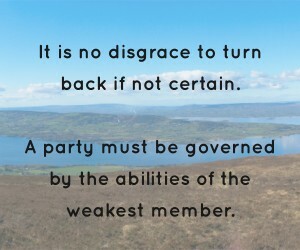 A party must be governed by the abilities of the weakest member.